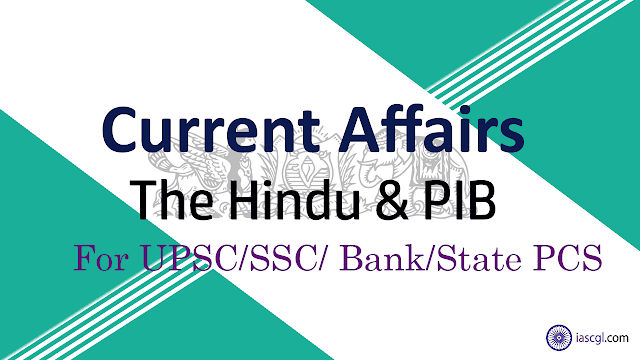 05th October 2018, Current Affairs and News Analysis for UPSC Civil Service Examination, SSC CGL and State Civil Service Examinations. The UN recognised Modi with its highest environmental honor in the policy leadership category for his efforts to eliminate all single use plastic in India by 2022. President of France, Emmanuel Macron has also been awarded in the same category for his work on the Global Pact for the Environment. They were selected for their pioneering work in championing the International Solar Alliance. India and France had together launched the ISA on sidelines of the UN climate conference (COP21) in Paris in 2015. The ISA is an inter-governmental body of solar rich nations whose objective is to galvanise actions for increasing solar power footprints in 121 potential member countries across the globe. The ISA is headquartered in Gurugram near New Delhi in India. India’s Cochin International Airport – the world’s first fully solar-powered airport – is also selected for the award. It is selected in the Entrepreneurial Vision category for its leadership in the use of sustainable energy. The nation must not only pay homage to its leaders on their birth and death anniversaries, but also make the younger generation aware of their stellar contribution to the good of the country. One such statesman is Lal Bahadur Shastri, who is remembered every year along with the Father of the Nation, Mahatma Gandhi, on October 2. Like millions of Indians, Shastri drew inspiration from the Mahatma and plunged into the freedom struggle when he was in his teens. More than 60 years ago, Shastri showed what probity and integrity in public life are all about. Following a train accident at Ariyalur in Tamil Nadu, in which more than 140 people were killed, he resigned as railway minister taking moral responsibility for the incident. Lauding him for his integrity, the then Prime Minister Jawaharlal Nehru said that he was accepting his resignation because it would set an example in constitutional propriety, although Shastri was in no way responsible for it. He displayed a broad outlook at a very young age and dropped his caste-based surname when he was in the seventh standard. His progressive attitude came to the fore when he asked for khadi cloth and a spinning wheel as dowry. His maiden Independence Day speech in 1964 is as relevant today as it was then. Shastri observed: “We can win respect in the world only if we are strong internally and can banish poverty and unemployment from our country. Above all, we need national unity. Communal, provincial and linguistic conflicts weaken the country. Therefore, we have to forge national unity. I appeal to all to work for national unity and usher in a social revolution to make our country strong. In the ultimate analysis, the strength of the country does not lie in its material wealth alone. It requires people like Mahatma Gandhi, Jawaharlal Nehru and Rabindranath Tagore. It requires the force of character and moral strength. I appeal to our young men to inculcate discipline in themselves discipline and work for the unity and advancement of the nation”. His stress on character and moral strength acquire special significance today, when we see all-round degeneration of values in various fields. During the Indo-Pakistan war in 1965, Shastri gave the immortal slogan, “Jai Jawan, Jai Kisan,” which continues to inspire every Indian even today. During his prime ministerial tenure, which unfortunately was cut short by his untimely death, Shastri boosted the morale of the nation by leading India to victory over Pakistan. His vision for self-sufficiency in foodgrains led to sowing the seeds of the Green Revolution, and promotion of the White Revolution. The country owes it to him in no small measure that we are self-sufficient in foodgrains production today. During his speech at death anniversary of Swami Dayanand Saraswati he said : “The nation cannot afford to relax. It is difficult to say what the future holds for us. Pakistan had not yet given up her policy of aggression. The duty of the nation is therefore clear. The country’s defences have to be strengthened. The people should spare no efforts to strengthen the defences. Side-by-side, food production has to be increased. Food self-sufficiency is as important as a strong defence system. It was for this reason that I raised the slogan, ‘Jai Jawan, Jai Kisan’. The kisan is as much a soldier as the jawan”. Many years later, former Prime Minister A B Vajpayee added “Jai Vigyan” to Shastri’s slogan in order to hail achievements of Indian scientists. His humane quality was reflected in another instance. As Uttar Pradesh’s Minister of Police and Transport, he ordered that the police should use water jets instead of lathis to control unruly crowds. The fact that Shastri was the first transport minister to open the post of bus conductors to women showed how forward-looking he was. His visionary outlook is reflected in the observations he had made at a rural projects meet in Delhi in 1964. “We must inject new elements in the services. Let us introduce professors, economists, teachers, engineers and others, even outsiders, so that there is some freshness, a real exchange of views, a meeting of different approaches,” he said. Perhaps, the government’s decision to open 10 senior civil services positions for lateral entry is in line with this philosophy. The world heritage site is classified as “endangered” by UNESCO. It is located west of Tripoli, in Libya. It was an ancient Carthaginian city on the coast of north Africa. It lies on the Mediterranean coast about 70 km west of modern Tripoli. The extant archaeological site was inscribed as a UNESCO World Heritage Site in 1982. Since the toppling and killing of Libya’s dictator Muammar Qadhafi in a 2011 uprising, Sabratha has become a key departure point for illegal migration. Smugglers and militias have profited amply from a chronic security vacuum. It is from the long and deserted shores a few km from ancient Sabratha that most migrants start their perilous boat journeys towards Europe. Up until the end of August, flying a drone was mostly illegal in India. With the publication of the drone regulations in late August, the Ministry of Civil Aviation has attempted to give some structure to the development of drone infrastructure in India. The acquisition of the Rafale fighter jets and the S-400 air defence system will go a long way in addressing the depleting squadron strength of the Indian Air Force (IAF). 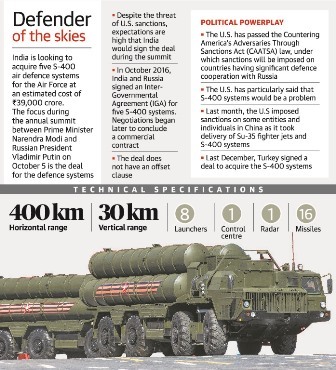 India and Russia are expected to conclude an agreement for five regiments of the S-400 Triumf air defence system. However, the US has urged India to forgo S-400 missile deal with Russia, warning that the deal could attract American sanctions. Will President Trump waive these sanctions? Government to grant licenses to build villas and attract tourists from across the globe. These will mainly be eco-cottages, for which private players can bid to build. The first State water grid portal was launched here on Wednesday along with the start of fourth phase of the Jal Swavalamban Abhiyan, which is the Rajasthan government’s flagship water conservation project. The campaign has led to construction of about 4 lakh water harvesting structures in over 12,000 villages. Mobilizing financial resources from multiple sources- Line Departments, NGOS, Corporate houses, Religious Trusts,Nonresident villagers, Social groups etc. Recently, the Supreme Court’s ruled, in a 4:1 majority, that the exclusionary practice of women in the 10-50 age group from the Sabarimala temple in Kerala, violates the rights of women devotees. The apex court was assessing the constitutionality of the Sabarimala custom of excluding women in their ‘menstruating years’. The custom was allowed by Rule 3(b) of the Kerala Hindu Places of Public Worship Act, 1965. Justice Indu Malhotra was the lone dissenting voice. Justice Indu Malhotra chose not to review the religious practice on the touchstone of gender equality or individual freedom. Her view that the court “cannot impose its morality or rationality with respect to the form of worship of a deity” accorded greater importance to the idea of religious freedom as being mainly the preserve of an institution rather than an individual’s right. She asserted that issues of deep religious sentiments should not be ordinarily be interfered by the court. Further, she went on to add that the court should not interfere unless if there is any aggrieved person from that section or religion. What constitutes essential religious practice is for the religious community to decide, not for the court.